On the day I planned, Konda was away on a school tour and I very badly missed her help. I started my preparation at 9 in the morning, with interludes of breakfast preparation happening, I completed it by 12.30 pm. Amma said she will help me, however seeing the way I looked, with four, plus a MW going, she said she better just sit and assist if needed. 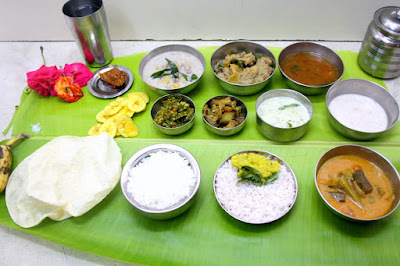 We are not new to Kerala food, infact I must say that its almost like our home food. Amma always has the pure cooking coconut oil with her as well. I don't use much as Hubby dear is not very fond of the oil. However I know he loves the dishes minus the oil. So decided I would cook with regular one. I also had some dietary restrictions that I had to follow and that meant I include dishes that can be eaten by all. I decided on my menu based on what could be feasible with the given time frame. Initially I was looking at making some 5 - 6 dishes. Finally I ended up making about 10 dishes. Infact I was planning on a bigger menu was in a better position. Still I was quite happy with the end result. This Sadya Menu does not cover all the dishes that is prepared as part of Onam Sadya. However its my humble attempt at making all the dishes in one shot. I made about 12 dishes and the time frame given below is more for my own reference than anything else! 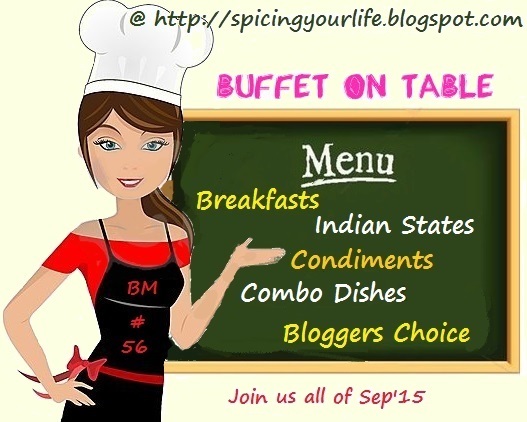 My Onam Sadya recipes are heavily adapted from Sangeetha and Rajani. I was drooling and feasting over their pages for several days and this is the end result. I would like to thank them for being so generous in sharing their knowledge and wonderful pictures of Sadya dishes. All the dishes are very simple to make, provided you understand what goes in first and what needs to be prepped ahead of time. Since this feast is going to be a Neivedyam, everything has to be fresh. So there is no question of you chopping or cutting the previous night. Serving has to be on a Banana leaf, so ensure you visit your market early morning to get fresh leaves. Since I had some of the Sadya dishes already done, I didn't pick them up. Soak Brown Channa and Black eyed Peas overnight. Change water couple of times and pressure cook separately. Have two coconut grated. I got about 4 cups of grated coconut. Soak the Sambar, which uses Shallots, onions are not used mostly, unless mentioned. Since I was planning on cooking Chemba Rice, this needs more washing and soaking. So did that in the beginning itself. Soak Ponni Rice separately for those who don't' eat Chemba Rice. Take 2 and 1/2 cup of grated Coconut and grind it along with 10 - 12 green chilies with 2 tsp of Cumin. Grind to an almost smooth paste without adding water. Change the soaked chickpea and Black eyed peas couple of times and pressure cook with enough water for 3 whistles. I was making two dry vegetable dishes. So chopped them first and make the thoran. Since these need to be cooked on simmer, you can start with these two. Chop Drumstick and Potato, MW each for 5 - 7 mins. Peel and chop Onions required for Potato fry and Sambar. Chemba Rice takes a long time to soak, so soak this the beginning itself. You will have to wash it nearly some 6 -7 times, till you get a clear water. Rice is cooked by draining method and not absorption method, so bring a big pot of water to boil. I soaked it for nearly 40 - 45 mins. Then in a big Pressure cooker, I cooked the rice. As the rice was getting cooked, I got the regular rice soaked and pressure cooked as well. Coconut was ground for the Milk required for Olan. Once all the vegetables are cooked, you can start the preparation right away. Next went on to make Kootu Curry and Paruppu Curry. Once done, tempering for all dishes. All the dishes require tempering at the end, so the best way to make is to cook the vegetables and take whats needed for which recipe and add the ground paste, bring to boil and finally temper in one shot. As with all traditional thalis, serving on the Banana leaf follows a rule. You start with serving the salt on the left narrow spot. Even this small feast was so heavy for us and my family enjoyed as expected. I was very glad that I managed to make it.